Trainer Jorge Navarro saddled his 56th winner of the Monmouth Park meet when Go Trumpy Go captured the final race on the Sunday program, giving the 41-year-old conditioner the new record for most wins in a single season at the Jersey Shore racetrack. The previous record was established by John Tammaro III in 1974, during a 60-day meet, and equaled one year later by J. Willard Thompson when the racing season spanned 75 days. 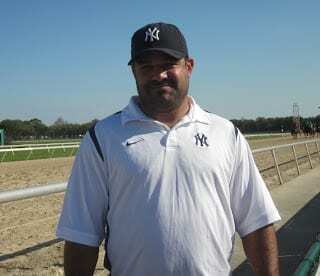 Since then the only two trainers reached the 50 win mark – Mark Shuman with 50 in 2003 and Bruce Levine with 54 in 2008. Navarro had captured 47 wins in 2013, 43 in 2014 and 42 last year. Navarro entered the penultimate weekend of live racing with 51 victories. He captured a pair of races on Saturday's program and scored a hat trick on Sunday's card, culminated by Go Trumpy Go's wire-to-wire win in the finale. Navarro broke the record after receiving an administrative complaint filed against him in Florida due for a Class II drug violation. The charge is resulting from a race on May 1 at Gulfstream Park, according to myfloridalicense.com. It was the 20th complaint filed against Navarro in Florida for medication-related violations since 2012. Monmouth Park's 57-day 2016 racing season has two more live cards – Saturday, Sept. 24 and Sunday, Sept. 25. Gates will open 11:30 a.m. with first post 12:50 p.m. both days. Following next Sunday's program, live Thoroughbred racing shifts north to the Meadowlands for 14 all-turf cards beginning Sept. 28. As always, Monmouth Park is open seven days a week for simulcasting from across the country and around the globe. This entry was posted in People and tagged bruce levine, jorge navarro, mark shuman, monmouth park, single-season win record by Edited Press Release. Bookmark the permalink.